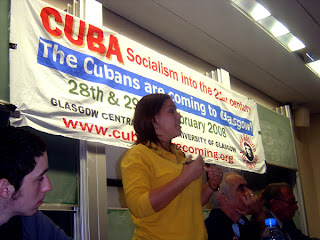 Over 100 people braved driving wind and rain to come along and hear three generations of Cuban revolutionaries speak at the University of Glasgow following a packed meeting in central Glasgow the previous evening. The atmosphere in the hall was relaxed as the crowd of young people, students, university staff and a class of pupils and teachers from a southside secondary school listened to Yoselin Rufin speak. Relating from her own experience as a young student, teacher and political activist, Yoselin explained the Cuban conception of education, based on the centrality of the individual student, not only as a pupil but as a complex social being with many problems and relationships which every teacher had a responsibility to understand and care about. Her speech carried extra resonance in a city where many tens of thousands of working-class children grow up in conditions of poverty, deprivation and abuse and university remains largely the preserve of the wealthy. Following warm applause, Jesus Garcia spoke about the nature of Cuban democracy, or rather the system of representation developed by the revolutionary Cuban people since 1959. He explained how basic principles of Cuba’s socialist system such as the right of recall together with the 2,000-odd mass organisations ranging from the Federation of Cuban Woman right down to associations of canary breeders (!) meant that the Cubans were practically implementing the concept of the “withering away” of the workers’ state as explained in the theory of Marx, Engels and Lenin. 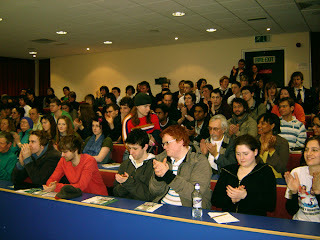 Orlando Borrego took the floor to laughter and applause as he told the audience of the many different topics RATB comrades kept asking him to talk about before the very many meetings he had addressed in cities and towns throughout the country, from the economic ideas of Che Guevara to the development of Cuban socialism and now in Glasgow University about Hugo Chavez and the Venezuelan Revolution. He drew parallels between the life of Simon Bolivar, the “liberator” of Latin America and the admiration held for him by Jose Marti, the apostle of Cuban independence, and the relationship between Fidel Castro and Hugo Chavez. Borrego shared the extraordinary pride he felt in being able to work alongside Chavez after being personally invited by him to discuss Che’s ideas on socialist construction and appear on the president’s TV programme “Alo Presidente!” He finished by giving his thoughts on the developing Venezuelan revolution and some of the dangers it faced. 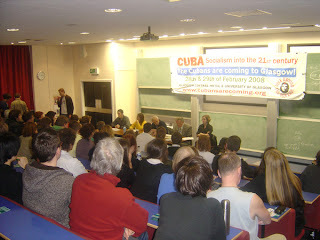 In the discussion that followed, the Cuban comrades were very impressed by the level of political interest shown by the secondary school pupils, who asked questions on the causes of the collapse of the socialist countries in Eastern Europe and any advice the Cuban revolutionaries could offer to the socialist movement in Scotland. In response to the latter, Jesus Garcia said that he was not familiar enough with the situation in Scotland to give any concrete advice, but the key points from his own revolutionary experience were to firmly place socialism in the culture and history of one’s own people, consistently practice internationalism and to study everyday the works of thinkers like Marx Engels, Lenin, Rosa Luxemburg and Gramsci. Borrego moved the audience with some touching anecdotes about Che Guevara that highlighted the humanity of the great communist. Barely a sole left as the wind outside shook the university tower and the meeting was extended half an hour to accommodate extra questions. 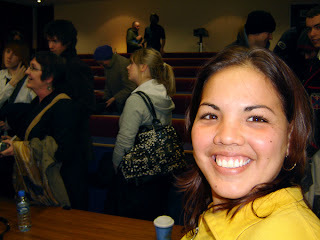 At the end, people stuck around to discuss with RATB comrades and join the campaign, and students from Spain, Bolivia, Argentina and India mingled with Scottish school students and teachers, everyone inspired by a great meeting.